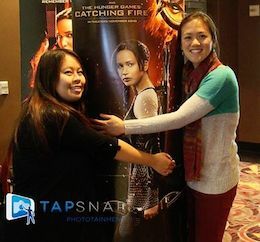 TapSnap has taken phototainment to a new level with a one-night, 24-city social media blitz for the cross-country premiere of Catching Fire. The hugely anticipated sequel to The Hunger Games hosted red-carpet screenings in 24 major U.S. cities on November 18. The TapSnap phototainment system was there, giving Catching Fire fans the opportunity to capture photos of their special night using the giant touchscreen. Then fans were able to use TapSnap’s instant social media sharing to let friends, family and the world know they were at the movie event of the season. TapSnap is a great way to engage with guests and fans by giving them something they really want: exciting pictures of themselves to share on social media. “TapSnap fuels the conversation. It encouraged engagement with Catching Fire fans, by giving them stunning pictures of themselves of themselves on the red carpet at the Catching Fire premiere and making it easy to share those pictures live on Facebook and Twitter,” says Scott. Catching Fire used TapSnap to exponentially amplify social media sharing about their movie on launch night. Not only did TapSnap accelerate sharing at their events across the country, but the effects multiply for weeks afterwards as people continue to share their pictures, and talk about their premiere experience. Even fans who weren’t able to attend can get in on the excitement by seeing pictures of their friends at the event live on social media. Our team of TapSnap franchisees worked together across the country to make this night a success. This event shows the power of our national brand, how together we can handle large-scale branding events that wouldn’t be possible without the strength of our team behind us. 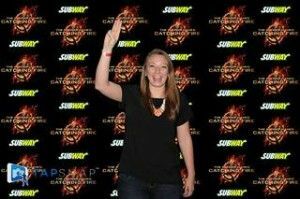 New York fan at the Catching Fire premiere. TapSnap franchisee Milton Guerrero was at the heart of New York City in Times Square for the event, where event guests captured the moment against a Catching Fire backdrop. “I’m so excited to be a part of a multi-national deal and be at the premiere of a movie that is so greatly anticipated. An event like this shows the full capability of TapSnap and the buzz we are generating across the country,” says Milton.